Naoyuki Shimizu has agreed to join the management of Baseball New Zealand. 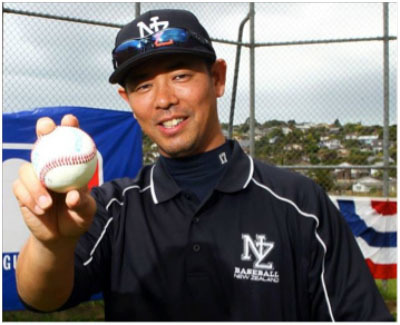 Baseball New Zealand has announced the acquisition of Team Japan’s 2004 Olympic bronze medalist Naoyuki Shimizu, who will head to New Zealand next month to work full-time in the development/management of Baseball New Zealand’s National Team programme – which is ranked No. 28 at the world level and No. 2 within Oceania. The 38-year-old Shimizu, who was also part of Samurai Japan’s gold medal performance at inaugural World Baseball Classic in 2006, has over ten years of professional baseball experience and was a pitcher for the Chiba Lotte Marines of Japan’s Nippon Professional Baseball – Japan’s top baseball league. In January, Shimizu visited New Zealand to help assess, identify and coach talented young ballplayers as part of Baseball NZ’s “Training with the Pro’s” session, at which point both Shimizu and Baseball NZ leadership initally expressed serious interest in developing a long-term strategic-plan together. During the same visit, Baseball New Zealand CEO Ryan Flynn praised the well-credentialed baseball background of Shimizu. "Attracting a person of Shimizu-san's talent and fame to take an interest in our blossoming programme is a huge coup for Baseball in New Zealand," said Flynn. Shimizu will now officially join Baseball NZ as “Head of Player Development” for the U12, U15 and Elite National Teams and will also become the Assistant General Manager of Baseball New Zealand's national governing body.